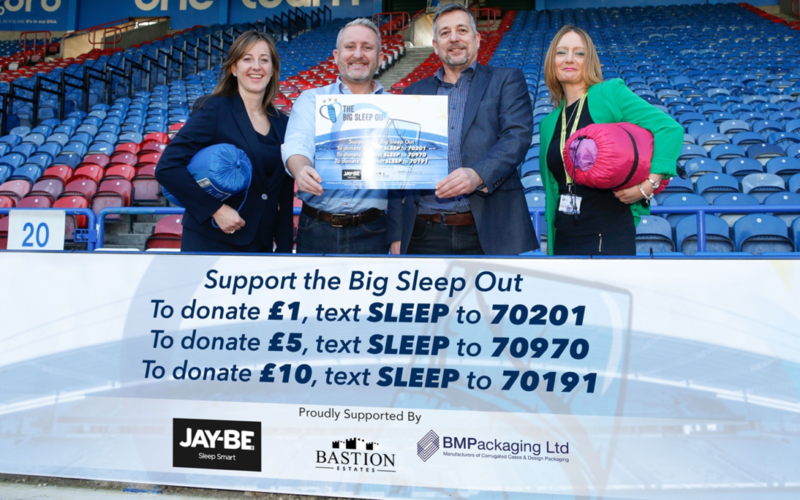 On a cold windy and wet night in February 2018 Bastion sponsored and took part in The Big Sleep Out with fellow Huddersfield supporters, staff, Club partners sponsors. From a fund raising point of view the event was a huge success and taking part was humbling. Wind the clock forward to February 2019 and here we are again. Bastion were asked to be one of the sponsors and of course we agreed again. It was a lot colder this year and there were occasions where we had to hang onto our cardboard boxes in the strong wind. My two sleeping bags kept me warm but I’m not sure many of us got much sleep. In a way it was fun because we knew we would be raising awareness and huge funds for incredibly worthy charities and with some great people, but of course our one off ‘fun’ can only be described as such as we then went to our nice warm homes. I’m not aware of the final total but I did hear we hit £40,000 which is superb.